Philips has unveiled a brace of multiroom speakers aimed specifically at Spotify users, designed to simplify that moment of switching between headphones and a home speaker system. Based around Spotify Connect, the speakers simply play whatever is playing on your native Spotify app. Once a device with a Spotify account is on the same wifi network as the speakers then you have the option to select them as an output. There's also a manual button on the top of the speaker, which also functions as play/pause and skip if you don't want to grab a device to use the in-app controls. Because the speaker is streaming direct from Spotify in the cloud, this frees up your tablet or phone for other duties, so calls/etc don't have to interrupt your playlist. Want them to? The manual volume buttons atop the speaker allow you to pick up an important call and mute/drop the volume manually. On stand demos made this look pretty seamless, but we'll keep you posted with a full review as soon as poss. The Philips Spotify multiroom speakers also come with a separate app that enables you to easily group multiple speakers into a single set. Just set this up once and you can then select the speaker group in the native Spotify app anytime you want. 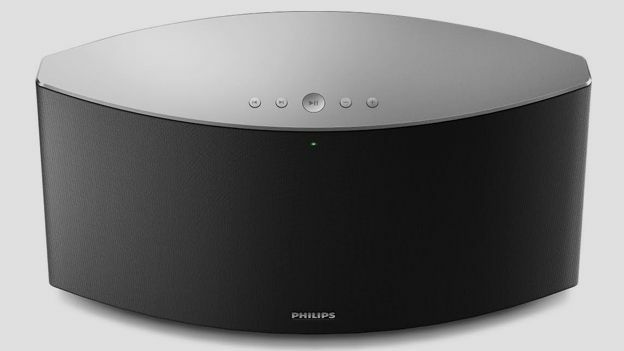 There are two models in the Philips Spotify multiroom speaker range, a small SW700M and a larger SW750M. The SW700M includes two 2.5” full-range speaker drivers and two expanded bass ports, while the SW750M incorporates two tweeters and two 3” full-range drivers. Both speakers can be used in combination across different rooms for a true multiroom experience. The Philips Spotify multiroom speakers will be available from October, priced at €99.99 for the smaller SW700M, and €149.99 for the larger SW750M.